This is the second in a series showing how far one group of elected Republican Harris County officials has veered from the Texas Republican Platform, thus arguing the need for a county recall law. Now, let’s look at a few more sections of the Texas GOP Platform that have been totally ignored by these elected officials. Because the HCDE Trustees will be holding Public Hearings on 9/27/12 and 10/9/12 to enable them to legally pass a TAX INCREASE on 10/23/12, this article will take a close look at how well the HCDE Trustees oversee Harris County Education Dollars and how they plan to spend the added monies collected by their tax increase. What is “non-critical” school spending? Thesaurus lists synonyms for “critical” as “crucial”- “essential” -“vital”. That would mean to me that anything “non-crucial” - “non-essential” - “non-vital” would be excessive school spending. But you can decide for yourself. $466.66 for car rental expenses? $203.00 per night for a room? $99.00 for valet parking ? $53.49 for her dinner ? $36.40 + $45.79 for room service ? Or was it OK for the Board President to pamper herself with extras like room service, valet parking and $$$ dinners while traveling on school business because, after all, it is only taxpayer money? Was it excessive school spending when newly elected HCDE “Republican” Trustee Marvin Morris needed training on how to be a Harris County School Trustee, and he chose to gain his knowledge by attending the National School Board Association Annual Conference in SAN FRANCISCO, CA instead of a Texas location? Just how did the HCDE Trustees “maximize” our Harris County education “resources” in these “trying times” while they were in San Francisco? First, records show no Motel 6 nights for this group. Trustee Debra Kerner chose to stay at the San Francisco Marriot Marquis for $262.33 per night while the others chose the Grand Hyatt San Francisco for only $216.12 per room per night. And no sharing of rooms like teachers have to do. Each HCDE Trustee, administrator and “consultant” had their own room for three nights paid with Harris County education funds. And while in San Francisco learning “how to maximize resources,” the group ate at some pretty nice restaurants paid by Harris County taxpayers. 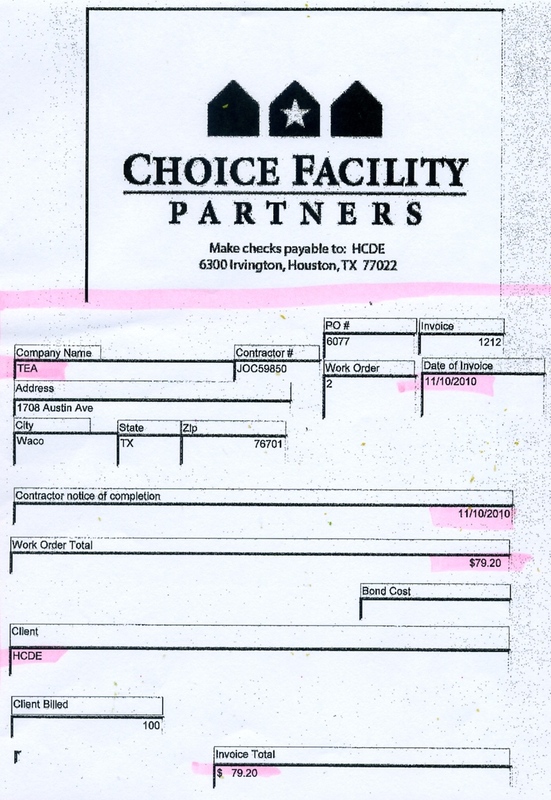 Receipts acquired through open records show when the HCDE group dined at the Brazilian Steakhouse, Espetus Churrascaria, the Superintendent did subtract his bottle of $42 Abadia Rituerta wine from the $713.07 dinner tab. But no mark outs are shown on the receipt for Capote Tinta Roriz or Baileys coffee. Do you consider a meal where just the TAX + TIP totaled $177.77 to be frugal use of taxpayer funds? Well, at least it was more frugal than the group’s next meal out together when they were in the mood for Italian cuisine. That night they chose The North Beach Restaurant, where their total bill came to $1,026.00. 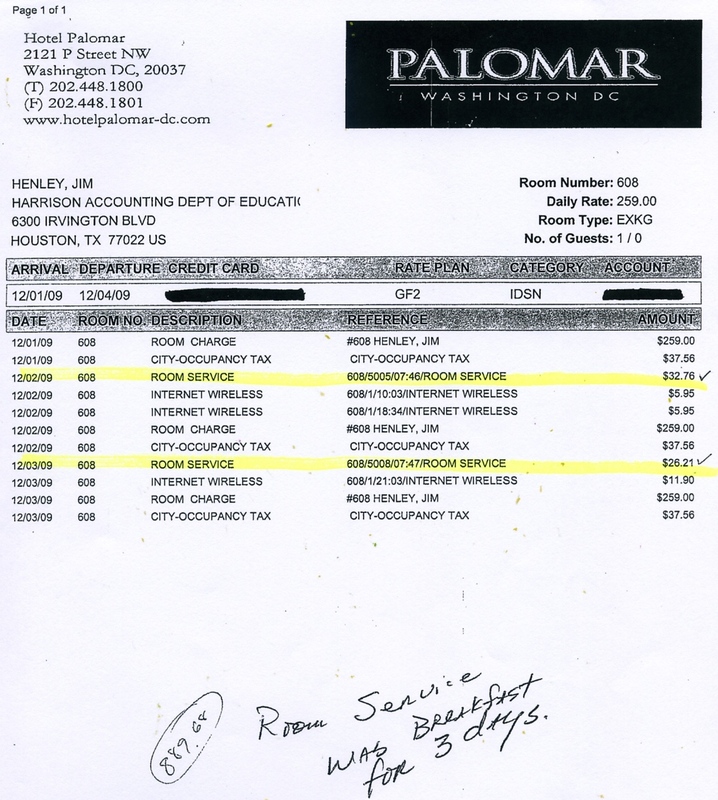 That night TAX + TIP alone was $243.87 of Harris County education dollars. And then there was the $860 PER PERSON conference registration fee, air fare, baggage fees, taxis, airport limo service, ……… all paid for with Harris County education funds. So what great report did the travelers present at their next HCDE Board of Trustees meeting on 4/19/11? Jim Henley reported on his attendance to the EcoBot Challenge Saturday, April16, 2011. Debra Kerner reported on her attendance to the National School Board Association (NSBA) Convention in San Francisco April 8-11, 2011; the Head Start policy council meeting; and the EcoBot Challenge. She announced that she would like to dispel rumors that she is running for city council. She confirmed that she is thinking about running for city council but has not made a definitive decision. Jimmy Wynn addressed the Board regarding current legislation and state funding/budget. So, do you think their weekend trip to San Francisco was “critical” - “vital” –“essential” to our schools or was it excessive spending? Records show that on the list of HCDE vendor payments of over $2000 from HCDE Procurement cards, HCDE Trustees approved $148,767.41 just for airlines and hotels from last September to July. This amount DOES NOT include any payments or reimbursements billed through other means. It also does not include reimbursements made for meals, taxi and limo services, room service, mileage, or other travel expenses. 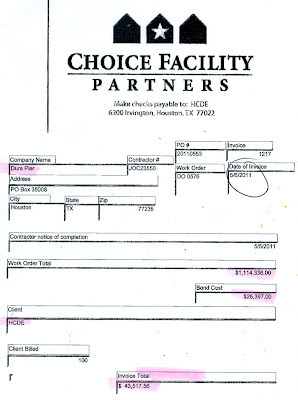 Records show billing the taxpayers for room service is common practice at HCDE, especially for administrators and consultants staying at high end establishments like the Ritz-Carlton. The following chart shows examples of other recent payments approved by the “Republican” HCDE Board of Trustees. Were they ALL really “critical” - “vital” –“essential” to the operation of Harris County public schools? Or were they “non-essentials” –--- items that did not increase student learning? Have these “Republican” led Trustees demonstrated to taxpayers that they follow the GOP Platform and govern so frugally that they should be entrusted with a tax increase that will raise an extra $1 million from Harris County property taxes? Before you decide, you need to know what their plans are for the extra $1 million in new tax revenue this rate increase will collect. HCDE has developed a business plan for a new “entrepreneurial venture” called “Texas Cloud Consortium (TCC).” They estimate they will need $1 million to get it up and running. Just what is the CFP part of CP? It is a service sold by HCDE to procure contacts for governmental entities and non-profits all across the United States. To learn more, you can read all about their procurement process here. Choice Partners Cooperative offers quality, legal procurement and contract solutions to meet government purchasing requirements. 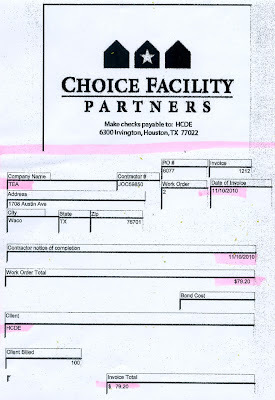 Staff at Choice Partners complete the legal, competitively bid government procurement process so YOU can act immediately to access the contract YOU need, saving time and money on the bidding process and purchase…..
Their online brochure explains their “transparent” process as well as the fact that CFP does all the legwork but the HCDE Board of Trustees actually “awards the contacts.” All this for a “No Cost Membership” into the co-op for government and non-profit clients. On the surface it appears that CP’s “NO COST MEMBERSHIP” means “NO COST TO MEMBERS” and “small percentage” sounds “small”. So what’s the problem? Second, the “Republican” HCDE Board of Trustees approve government contracts in their business ventures using a subjective point system. Price is only weighted 30% in the criteria. The vendor’s “past relationship with HCDE” is given weight. Documents acquired through open records show the percentage vendors pay back to HCDE from the contacts awarded through CFP range anywhere from 1% all the way to 40%. Records show many governmental entities have used CFP only to save time when a repair is needed quickly, not for bids that are not time sensitive. 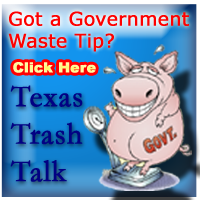 But taxpayers need to be aware that some governmental entities are using HCDE services to save themselves time and effort but not necessarily saving tax dollars. After reading through the invoices it is now obvious to me WHY the Texas GOP Platform mentions the bidding process for government contracts in the first place. I have made a chart for quick viewing of some of the invoices for “administrative fees” HCDE has billed their vendors. I have attached a scan of the invoice on the right for those who would like to print a copy. Some invoices look more to me like “redistribution of tax dollars” than a “small” fee for services, but you can decide for yourself. As you read the last three, remember the beginning salary for teachers in these districts is $35,000 - $45,000 per year. That means one contract through HCDE may have saved the administration time and effort, but it could also cost the district a teacher. 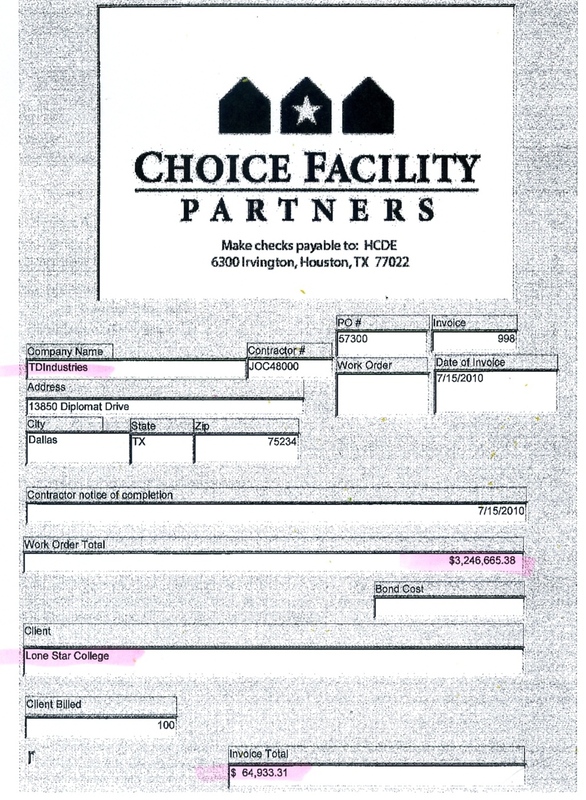 An interesting item found in the documents shows that HCDE is using CFP to bid some of its own district contracts. That doesn’t sound odd until you look at the “administrative fee” invoices. The “Republican” HCDE Trustees are approving HCDE’s own contracts for the “work order total” and then CFP bills the vendor for their “fee,” just like they do with other clients. 1. Why is HCDE charging ITSELF from 4% - 15% to award its own contracts? 2. Is a vendor really the best deal for taxpayers if the vendor can afford to return to HCDE between 15% to 100% of their work orders? The 100% “administrative fee” didn’t just show up when HCDE was the client. Did the Tarrant County taxpayers really get the lowest price? 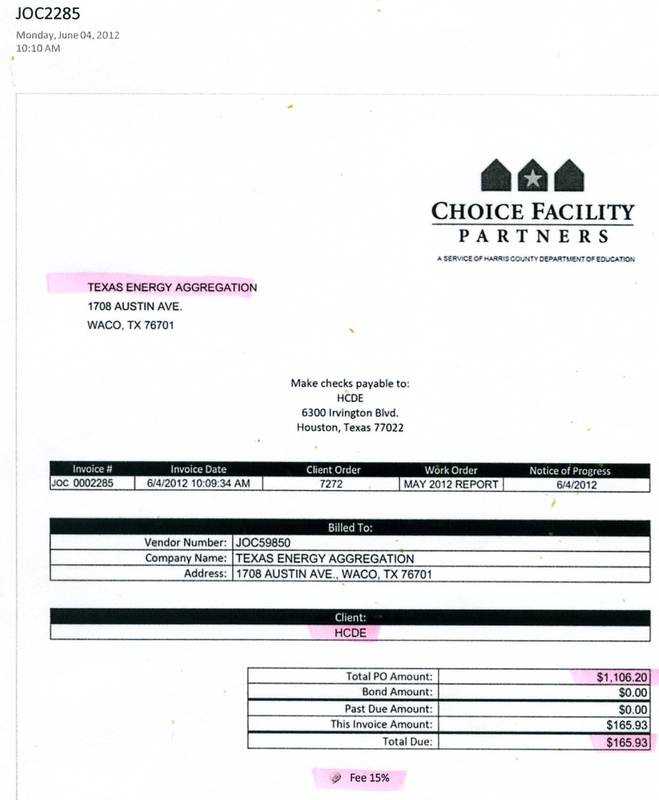 Do the Tarrant County taxpayers know that $25,317 of their tax dollars were “re-distributed” to HCDE by way of their Tradition Energy contract? After sorting through piles of CFP “administrative fee” invoices, I think the taxpayers who should have the most questions for their own elected officials are property owners in La Marque ISD and the Lone Star College system. Records show that from 2010-2011, La Marque ISD paid HCDE over $150,000.00 in CFP “administrative fees” --- or you could say, 3 teachers worth. With Lone Star College starting salaries at $52,000 --- that would have been 14 faculty members. After reviewing the documents , do you think the “Republican” HCDE Trustees should raise property taxes to collect $1 million to start another “entrepreneurial venture” like CFP? Or, should they adhere to the Texas GOP Platform, leave tax rates where they are, and learn to live within their means like the taxpayers have to do? You can let your elected Harris County School Trustees know how you feel about raising your tax rate by attending one of the HCDE Public Hearings at 3:30pm on 9/27/12 or 10/9/12, or you can email them about any issue at the contacts below. HCDE Trustees who voted NOT to hold hearings to allow HCDE to raise the property tax rate. HCDE Trustees who were absent for the vote. This is the first in a series showing how far one group of elected Republican Harris County officials has veered from the Texas Republican Platform, thus arguing the need for a county recall law. I would like to propose a new law. A law that allows voters to recall any elected official who runs for office on a party ticket in Harris County, Texas and then votes to use public funds AGAIST the party platform. Such a law would allow voters to get rid of phony Republicans - like “Republican” Harris County School Trustees – quickly, instead of having to wait 6 years for their term of office to expire. Yet, the “Republican” HCDE Board of Trustees is treating Texas Education Code 18.14(b) the same way President Obama treats The Defense of Marriage Act – with complete disregard. Because DOMA does not fit into our President’s political agenda, he just ignores it or refuses to enforce it. So, even though TEC 18.14(b) specifically states that the countywide education property tax called the “Equalization Tax” levied by the County School Trustees “shall be distributed to the …independent school districts of the county” according to the number of students per district, the HCDE Trustees have followed the lead of President Obama and chosen to simply ignore that particular law. I guess they have decided that they know better how to spend education dollars than ISD Trustees, because HCDE spends the funds themselves and distributes NONE to the ISDs. So, even though TEC 18.26 specifically states that the countywide education property tax levied by the County School Trustees is for the advancement of public free schools in the county, the “Republican” HCDE Trustees simply remove the words “public,” “free", “schools,” or “county” when desired. The HCDE “Republican” Trustees can also be compared to President Obama when he signs “Executive Orders” to advance his governmental authority. They have approved so many activities and enterprises so far beyond the boundaries of their county authority that the State Director of Texas Learns, Joanie Rethlake, is now listed as a “Local Government Officer” of HCDE in purchasing coop requests for proposals. Guess they have never bothered to read the Texas Republican Platform to know that Republicans in Texas expect Republican elected officials to use our tax dollars the way the law originally intended, not just any way they please. Many Harris County Republicans would be shocked to find that the five “Republican” Harris County School Trustees have used county education dollars to hire a Democrat Political Strategist, Pat Strong, to oversee HCDE’s extensive lobbying efforts for years. Of course, they don’t give her the title of “HCDE Lobbyist”. That would be too honest. Instead they call her their “External Relations Liaison Officer” and list her as a member of the Harris County School Administration. Just what are the “Republican” HCDE Trustees approving county education funds for Pat Strong to do for HCDE? She even provided a private phone consultation with Trustee Roy Morales concerning The DREAM Act. Pat Strong is the tour guide when the HCDE Trustees or Administration take a trip to Washington, DC to lobby IN PERSON, even though HCDE receives a large portion of their budget from Federal Grants. Receipts acquired through open records show HCDE “Republican” Trustees approved Pat Strong traveling to DC three times in one 14 month period. The HCDE Request to Attend documentation states the reason for the trip is “Congregational visits with US department of Education,” but the trip agenda outlines meetings with both members of Congress and the US Department of Education. Records show the “Republican” HCDE Trustees allow Pat Strong to use county education funds like a corporate expense account while traveling to lobby. On the first night of this particular trip in DC, Strong picked up the dinner tab for the group. 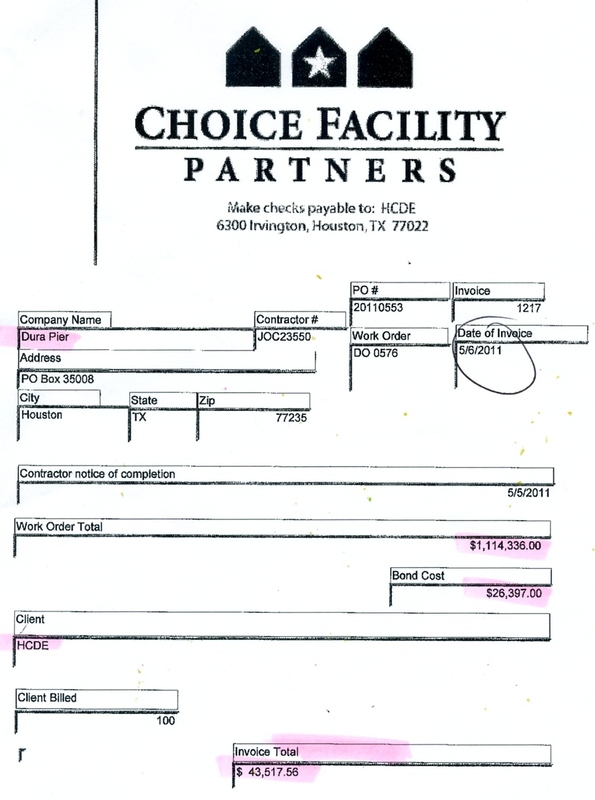 Why are Harris County taxpayers picking up the tab for someone not listed by HCDE as traveling with their group? I have no idea. What I do know is that this wasn’t the only time taxpayers picked up the tab for an extra person on this trip. Two points stand out about this dinner. First, only four names are written on the receipt as having dined with this group - and they happen to all be Democrats - Pat Strong, the 2 Democrat Trustees, and a former Democrat Congressman. They all dined together on a meal costing $267.85 plus a $55.00 tip for a grand total of $322.85 in Harris County education funds - all given the stamp of approval by a “Republican" Board. Now, had they gone to one location for appetizers and another for dinner, there would be no eyebrows raised. But take a closer look. Both receipts were paid by Patti Strong at 9:15 pm. Both receipts were for table #142. Both receipts are NOT ITEMIZED. The old saying goes, if it walks like a duck and quacks like a duck, it most likely is a duck - but you will have to decide for yourself. There are other questionable practices found inside the documents from this open records request besides “Republican” Trustees approving county education funds for lobbying, expensive trips and questionable “meal” purchases. Pat Strong is being PAID with COUNTY EDUCATION DOLLARS to attend regularly scheduled meetings of the HCDE Board of Trustees and the Houston City Council, both of which have meeting minutes available online. She is also being PAID with COUNTY EDUCATION DOLLARS to meet with various politicians and activist groups – groups like The League of Women Voters, One Voice, and the AFL-CIO. To understand the concern I have with the Monthly Status Reports Pat Strong filed with HCDE to justify her work as a County School Administrator, you must first take a close look at the clients she lists on her own company’s website. is also a client of Strong Strategies. Normally, none of this would be a concern. But when you take a close look at the Monthly Status Reports Pat Strong filed with HCDE to justify her work as an HCDE Administrator, some red flags appear. As you can see above, Pat Strong listed four “external meetings” that she attended on behalf of HCDE from Nov. 1 – 30, 2010. But 7 of the 8 persons listed are connected to another Strong Strategy client or actually are themselves Strong Strategy clients. Sue Lovell is a client. Terry O’Rourke is the First Assistant to client, Vince Ryan. KIPP Houston, a client, employs Mike Feinberg, Chris Gonzales, Amy Ward, and Sharon Simpson. Licia Green is the wife of client, Rodney Ellis. 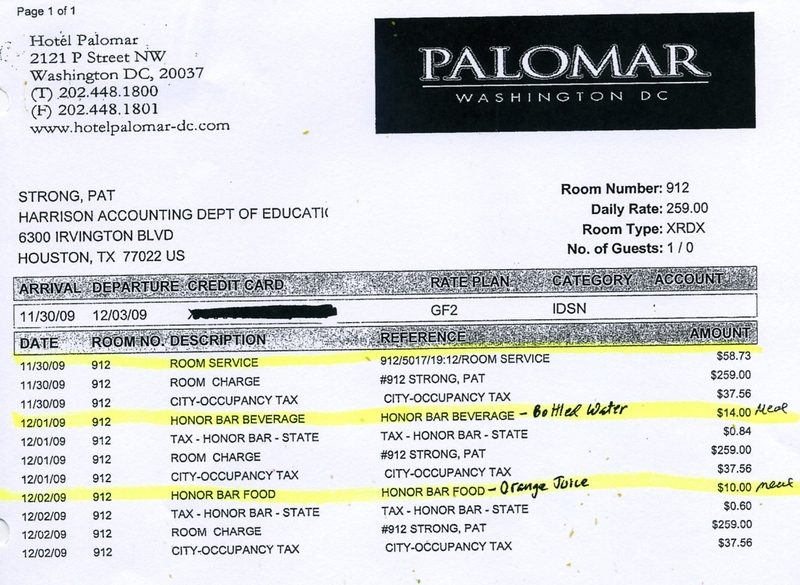 And, when you look closely at the records from the trip Pat Strong took to Washington, DC for HCDE in September 2010 – a trip paid for with county education dollars – you can see that on Sept. 23, 2010, Pat Strong met twice in the same day with another of her own clients, Congressman Al Green. And the same problem is found again in her Quarterly Status Report covering April 1 – June 20, 2011. Of the 16 “external events and meetings” Pat Strong attended on behalf of The County School Trustees, 9 were with her other Strong Strategies clients or staff of those other clients. And what a coincidence to find that HAR Connect posted a fundraising reception honoring Congressman Al Green, a client of Strong Strategies, on the exact same date that Pat Strong attended a Congressman Al Green “event” on on behalf of the HCDE “Republican” Trustees. Records show that 5 of the 6 Meetings Pat Strong listed on another Quarterly Status Report - also dated April 1 – June 20, 2011, but listing July meetings - were affiliated with other Strong Strategy clients. 2 Clients serve on Huston City Council. Terry O’Rourke is an assistant to client, Vince Ryan. Congressman Al Green is a client. 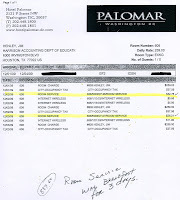 Read closely the details of “Visits With Elected Officials” reported on July 5 + 20, 2011. It lets us know that the “Republican” County School Trustees are not only paying Pat Strong to lobby in Washington, but paying her to take her own clients out for breakfast and lunch. This is how the HCDE “Republican” Trustees choose to spend our county education dollars ! Who are the 5 “Republican” HCDE Trustees?